This year is the first time we’re are doing a Valentine’s Day craft. Really, you ask? Really. I’m generally not a lovey-dovey-pink-heart-y kind of girl, but this year I’m feeling it. And we’re making it. I knew I wanted to do something with our ever growing collection of little mason jars. 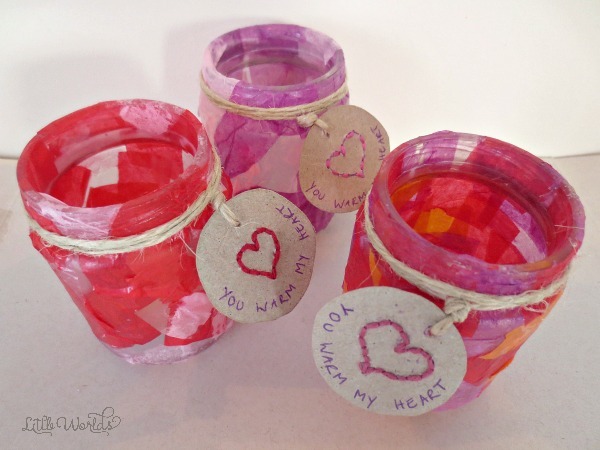 Inspired by the mid winter lanterns Noa and I once made at the Steiner playgroup, I thought it would be nice to make little Valentine’s Day versions. Then, inspired by the many catchy one-liners I’ve found on Pinterest, I felt the need to add to the list with “you warm my heart”. Cheesy but cute! 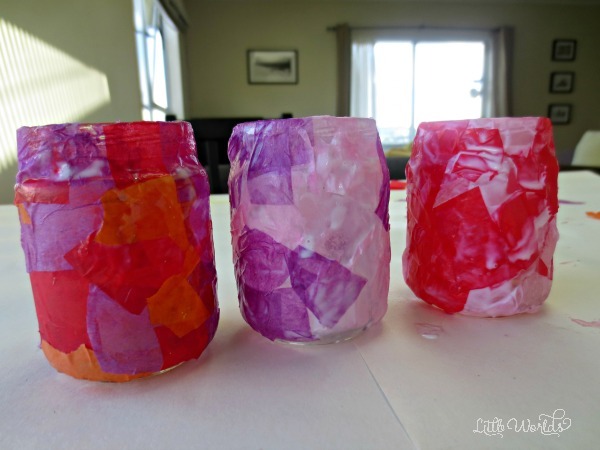 Here’s a quick tutorial to show you how we made them and all the love that went into our Valentine’s Day craft. paint brush, Q-tip, your hand! Some of you will need no guidance whatsoever and can cover a mason jar in tissue paper with their eyes closed. Others get frustrated even thinking about combining glue and tissue paper. So I’ll quickly talk you through it. I’ll warn you now: this is a messy affair no matter which technique you use! 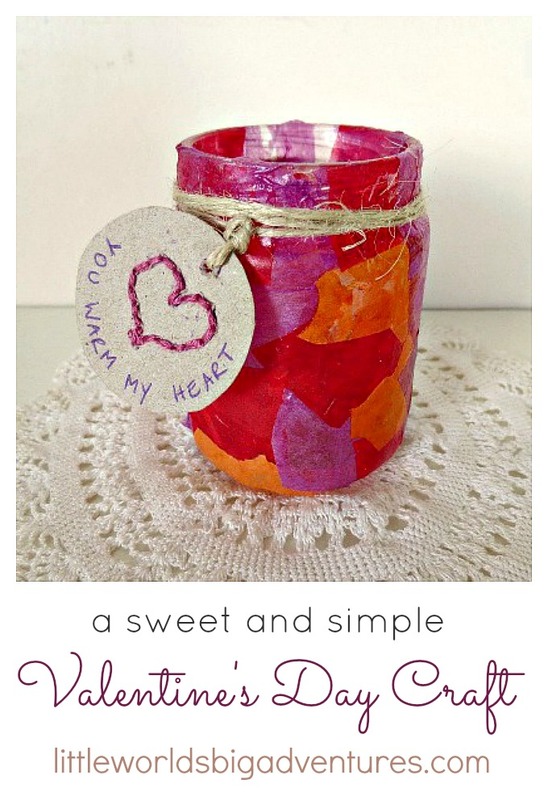 Grab your little jar and smother it with glue. You can simply use your fingers or use a paint brush if you don’t like getting paint on your hands. My little girl used Q-tips. Start putting the tissue paper on top of the glue. 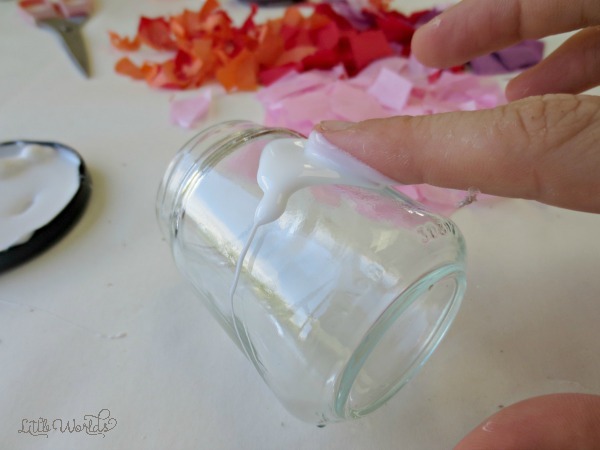 Try and cover the whole (outside) glass surface of the jar. It’s ok to double layer your tissue paper, it will look even nicer when the light shines through. At some stage around now you’re getting tissue paper and glue everywhere! That’s all good. One trick I learned is to keep everything moist with glue. When moist, it’s easier to man-handle the tissue paper, when your hands or brush are too dry, it’ll start sticking and tearing and annoying you. So if you get stuck, use more glue. Noa was trying hard not to get any glue on her hands and being very precise in placing her tissue paper. She’s explaining the process here. 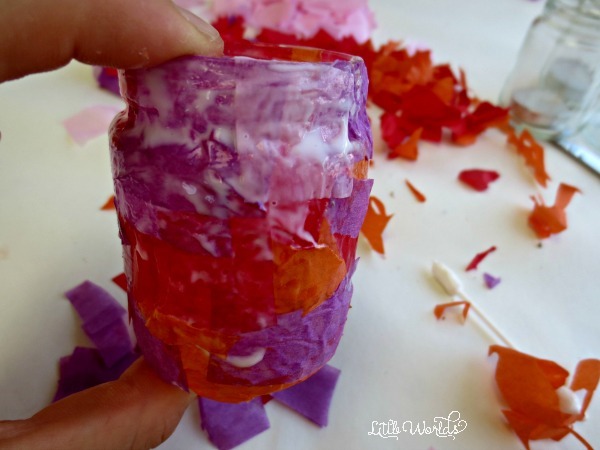 After you get a couple of layers of tissue paper and glue on, things should start to look a bit like the image below. I’m adding a little note here to say that I didn’t cover the bottom of the jar and that I did take some care to make sure the neck of the mason jar was nicely covered. If it still looks a bit messy, don’t worry, just add some glue (yes, that’s right: more) and smooth it all out as good as you can. Then you let it dry. It’ll take a while to dry, most people will recommend you dry it overnight and I second that. 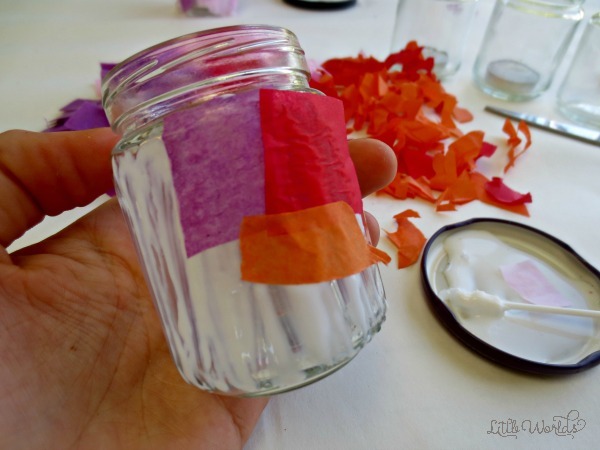 We did three little mason jars in different colour combinations. Noa insists I tell you that the pink and purple is her favourite, by far. 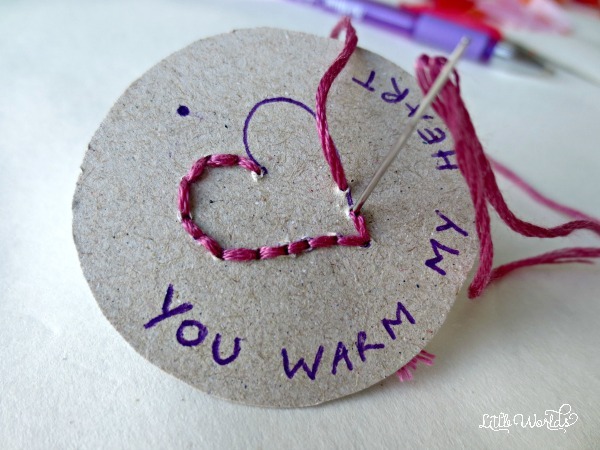 I got the idea for the label from this gorgeous Valentine’s Day craft by Red Bird Crafts. 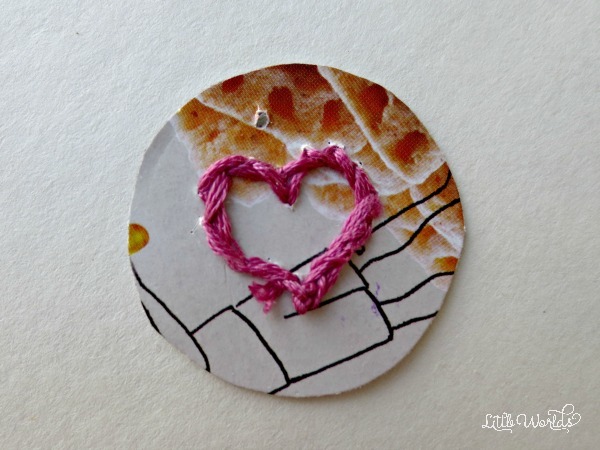 You can hop on over to read the full instructions on her blog on how to make sewn hearts Valentine cards. They are very cute! Put the tea candle on the cardboard and draw a circle around it. Then and cut out the circle. Draw a little heart in the middle of the circle. 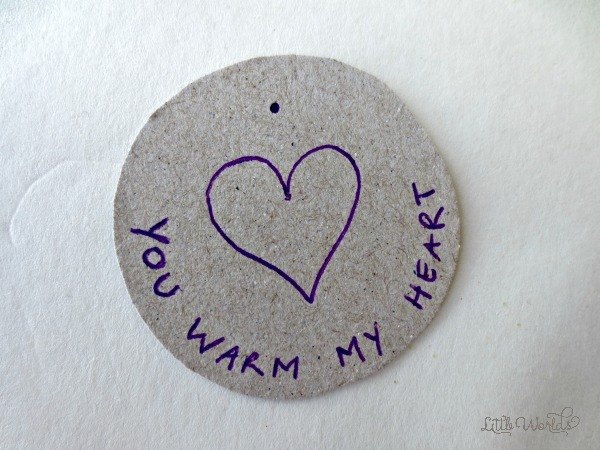 Write “you warm my heart” (or anything you want really) on the cardboard. And draw a little dot where you want the cord to go later. Now, thread your needle with your favourite colour of embroidery floss, make a knot on the bottom of the floss and start sewing. 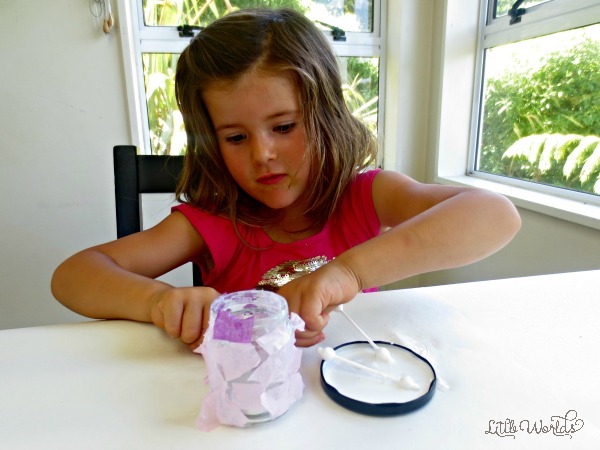 If you want you can pre-make some holes, like in the Red Bird Craft tutorial. (Since this tag is a lot smaller than her card, I used the needle to punch the holes in for Noa.) On the image below you can see I just followed the lines, back-stitching along the drawing. As you can tell, the floss will cover all the ink, so you don’t have to worry about that. Noa did a great job stitching most of the heart herself. She can’t do a back stitch yet but she’s quite happy to just follow the trail of holes. I’d just let children have a play with it. 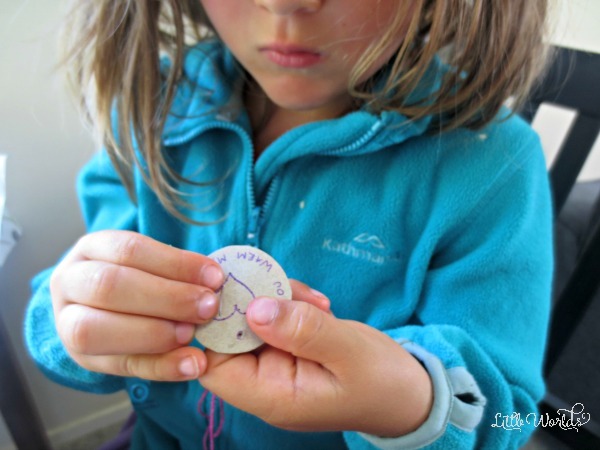 Even if that means the embroidery floss will go all over, under and around all sides of the little cardboard circle. It will still be cute, and very unique! For the back of the tag, I finished it off by tying both loose ends together and then weaving them in through the back of the stitches so it still resembles a heart. I quite like the slightly untidy look, there’s charm in things not being Martha Stewart perfect! Last, you pull the cord through the hole, tie a knot, wrap it around the neck of the (by now dry) jar a few times and tie a few knots on the other side of where the tag is and cut it off. Et voilà, it should look a bit like this. Cute, right? 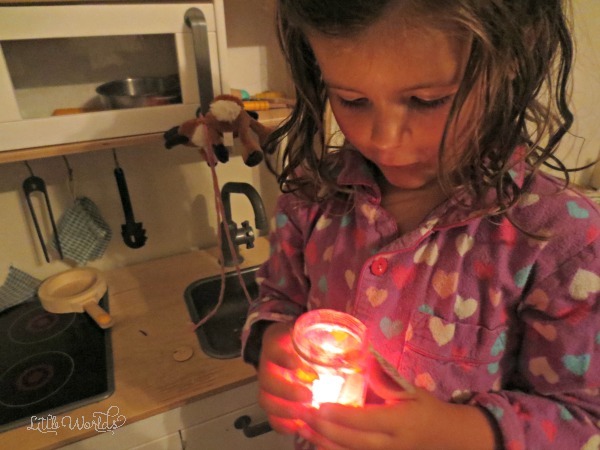 Noa was so very excited at night time to light the candle. She was so proud of what she mostly made by herself and wanted to take it into her bedroom so she could look at it while falling asleep. I truly hope this little activity will as much of a success as it was in our home. By now we have a box of them ready to hand out to friends. Noa is so very proud and is still fiercely holding on to her pink and purple one, which has a special place in her bedroom. And should you find yourself getting really into the Valentine’s crafts this year, do have a look at our easy watercolor and wooden beads garland. It’s gorgeous! Loved this post? Pin it here!